An innovative sediment containment solution removed and dewatered a large volume of contaminated sediments from an urban lake in Syracuse, New York. The material is now permanently contained in a compact naturalized area. The footprint used was considerably smaller than would be estimated based on the amount of sediment removed. This was achieved by stacking Geotube® containers to create a structure that can be expanded as needed. As a result, the sediment containment storage capacity drastically increased. About 2.1 million cubic yards (1.6 million cubic metres) of sediment, which had been heavily contaminated from a century of industrial activity, was dredged from Onondaga Lake and dewatered in a 50-acre (20-hectare) cell where six layers of Geotube® containers are held permanently. The Geotube® containers were then covered and capped with a barrier system to provide public health protection from the contaminants in the sediment, as well as to allow a natural habitat to re-establish on site. Geotube® containers have been successfully dewatering and containing sediment in a variety of applications for over 50 years. A single layer of Geotube® containers typically provides the capacity needed to achieve the required treatment performance in most applications. Since the 1990’s however, many sites have been struggling to contain and dewater a high volume of solids in a limited amount of space. To overcome this challenge, an approach that stacks Geotube® containers as much as 10 layers high was developed to maximize the capabilities of the system in a small land footprint. Compared to alternatives, Geotube® containers can be stacked higher since they are constructed using circumferential seams. 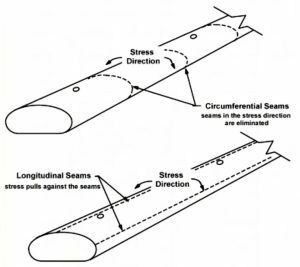 Since the seam is the area of highest stress, this method of seaming allows one longitudinal seam to run along the bottom of the container. With the seam facing downward, the stress and, ultimately, the safety factor are reduced. Conversely, conventional geotextile tubes are sewn in the longitudinal direction. This creates more points of stress and an increased risk of rupture. Stacking Geotube® containers to effectively meet performance requirements requires a good understanding of the site where they will be installed. Therefore Bishop Water uses a suite of analytical tools to ensure the stability and durability of the structures. One such tool, for example, can calculate the force that the structure will have on the surface where it will be built. Furthermore, to maximize the capabilities of the system, Bishop’s highly experienced team assists with all aspects of a project. This includes design, obtaining the appropriate permits, site preparation, and installation. Watch this video to learn more about the Onondaga Lake dewatering project in Syracuse, New York. Learn more about the differences between Geotube® containers and other geotextile containers.